Murray (Denis Shaw) and Rista (Terence Sewards) lie in wait for Miranda Loxton and her bodyguard in an underground garage. They open fire when a masked figure in a ballgown gets out of the limousine and the driver takes off again - the mask falls and they see they've killed the body guard. Tara drops by to see Steed and is surprised to find him carrying a gun, and Mother (Patrick Newell) and Rhonda (Rhonda Parker) in residence. Steed tells her he's to protect Miranda Loxton, key witness in the Murder International trial. Steed leaves to meet Miranda at a carpark, accompanied by Bobby Cleaver (Harvey Ashby) while Mother settles in, with relish, to sample Steed's liquor cabinet (sound familiar?). 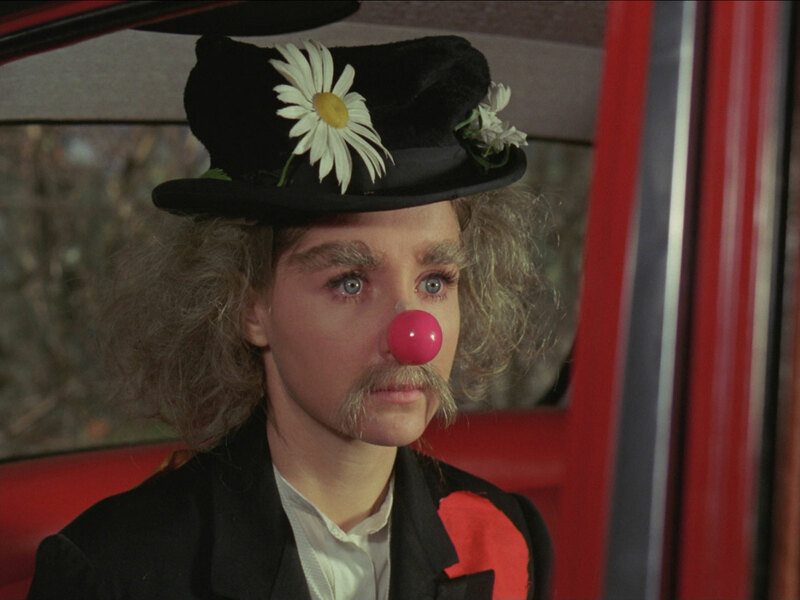 Cleaver hides in the back of the car with a dummy of Miranda's clown costume while Steed drives towards her, tailed by Rista. Cleaver takes over the steering wheel, hoiks the dummy upright and takes off while Steed and Miranda hide behind another car - with their tail gone, Steed and Miranda hop in the car and drive off in the other direction. Tara tires of waiting for Steed to ring when he reaches safety and goes off, jumping into Steed's Rolls outside. Murray emerges from under the tonneau and tells her to drive away quietly. Steed meanwhile pulls into a country lane and tells Miranda (Angela Douglas) she's safe and can remove her disguise - she does so and reveals an attractive young woman. Murray has directed Tara to a building supplies yard, she struggles with him when she is ordered from the car and notices a distinctive tattoo on his right hand before being knocked out. Rista scarpers in and injects her with a drug. Tara reawakes in a jumbled basement full of furniture and odds and ends; she overhears Murray telling Rista he's booby-trapped Steed's 'phone - on the third ring a bomb will go off and kill Mother. 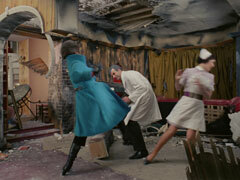 Tara breaks a window with a crutch and escapes, pursued by the villains. When she reaches the Rolls, she swoons from the drugs - moments later, it seems, she's in Steed's hallway, which sways queasily - she hears the 'phone ring and rushes for the door, a second ring, she opens it and ...bang - the ceiling and pillars falls around her as smoke envelopes her. She comes to briefly, wincing with pain, to find herself in a shattered apartment, Mother's wheelchair and pin-striped legs protruding from under the demolished fireplace. When Tara comes to again, workmen are clearing the debris. Major Firth (John Cairney) and Dr Wells (John Paul) notice she's awake and tell her they'll get her to hospital as soon as possible. She says her legs are numb, so Dr Wells prepares a needle to knock her out - while the workmen carry out the pin-striped corpse. Well's nurse, Jill (Kathja Wyeth), eases her back onto the pillow as she feels the jab of the syringe. When next she wakes, Firth is talking to Lieutenant Barrett (Mike Lewin); Jill notices she's awake and Wells tells Tara she's sustained multiple fractures and lacerations of both legs. Tara shouts she must warn Mother and, at a nod from Wells, Firth takes over. He asks her about her kidnappers until warned off by Wells; Tara remembers the booby trap but not much else, and Firth wishes they knew where Steed was. Tara tells him Steed is on a secret assignment but she doesn't know where. She suggests he asks Mother and Firth curtly replies that Mother is dead. 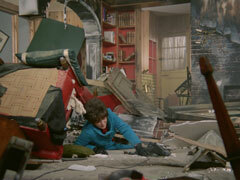 Steed leads Miranda into "Fort Steed", his childhood playroom, known only to two of his old boyhood chums. He pours her a glass of champagne and when she's upset about spending a whole week there, he pulls out his old toy soldiers. 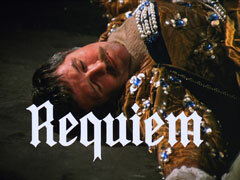 He mentions some of the battles he's recreated and is surprised when Miranda disputes his description of Déclair's retreat as "ignominious". 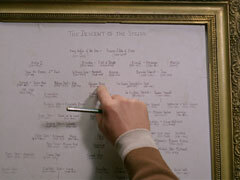 They agree to recreate the battle with Miranda playing Déclair. Tara meanwhile has remembered the phrase "Fort Steed" but can tell Firth nothing more. Lt Barrett enters and tells them he's founds plans for another booby trap, inside a gold pencil which Tara recognises as the same as one she gave Steed for Christmas. 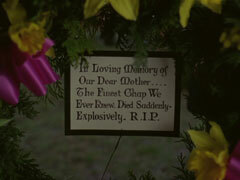 Firth implores her to remember before the bomb goes off. Back at Fort Steed, the battle is laid out. Steed tosses Miranda a pencil and pulls the gold one out for himself. Barrett comes to collect Firth, who is trying to deduce Steed's hiding place with Tara's help. Tara realises he's going to Mother's funeral and insists she come too. Wells agrees, but tells her she will be sedated for the journey there and back. The funeral is a quiet affair with few attendees, the vicar (john Baker) brief and businesslike. After the funeral, Tara remember Cleaver was working with Steed on the assignment and gives his address to Firth, who radios the information to HQ before driving round there. Murray and Rista are just leaving as they arrive and when Cleaver answers the door he collapses at Firth's feet. Back at Fort Steed, Steed capitulates, his troops decimated by Miranda's strategy. She tells him not to be too despondent, her father was a military historian and she cut her teeth on deploy strategies. Steed smiles and suggest they recreate the Battle of Trafalgar instead, and offers her the French fleet. Tara suddenly remembers ships - Steed had once told her about living near Henley and said "boats go on the river, ships go on the sea". Firth says it's a big area to cover, if they knew what sort of house it was it would help, and "stately home" doesn't narrow it down. Miranda surprises Steed by moving her Rear Admiral's ship to the front of the line and she disarms him by arranging her "boats" in a "pretty pattern". They hear a foghorn and Steed tells her they're quarter of a mile from the river. Tara tells Firth she was once at a Rococo Victorian house, with Grecian urns along a high wall, with Steed that he thought resembled his childhood home, and Tara suggests they try association of ideas, and asks to be returned to Steed's apartment. Wells agrees, on the usual condition of two sedatives. At Steed's she sees the carnations on the floor and remembers Steed mentioned roses around the door, the house in its own grounds and iron gates with faces on them, one laughing, one crying. Back at Fort Steed, Steed capitulates, his fleet reduced to a single pinnace which he describes as "awash with survivors". Miranda apologises, saying it was her Uncle Charlie, who was a naval historian. Steed chuckles and says his uncle was a chess Grand Master, and brings out a chess set. Firth meanwhile is getting frustrated and tries to force Tara to talk; Wells pulls him off and insists he let her sleep for an hour. Miranda is becoming nervous - not about the game of chess, but about anyone finding them. Steed concedes Tara knows of the house but not enough to find it. Tara wakes to find Murray offering her a drink - she recognises his tattoo and drops the glass then rings for assistance while he mixes another. When Wells and Firth arrive, she whispers to Firth that the orderly is one of her kidnappers. Firth knocks Murray down and he's dragged away by Barrett and a doctor; Firth orders them to find out who he is and how he gained entry. Tara stares at Murray's confiscated revolver in Firth hand then bursts out - she's remembered the house has a cannon-shaped weather vane which can be seen for miles. Firth is overjoyed and sets off to find the house. Back at Fort Steed, Steed is losing badly and Miranda admits her aunt is a Chess Grand Mistress. Tara meanwhile discovers her legs aren't numb, and aren't even broken, the plaster poorly applied and cracking. Firth scours Henley with Barrett and Rista while she gets out of bed and retrieves her clothes. 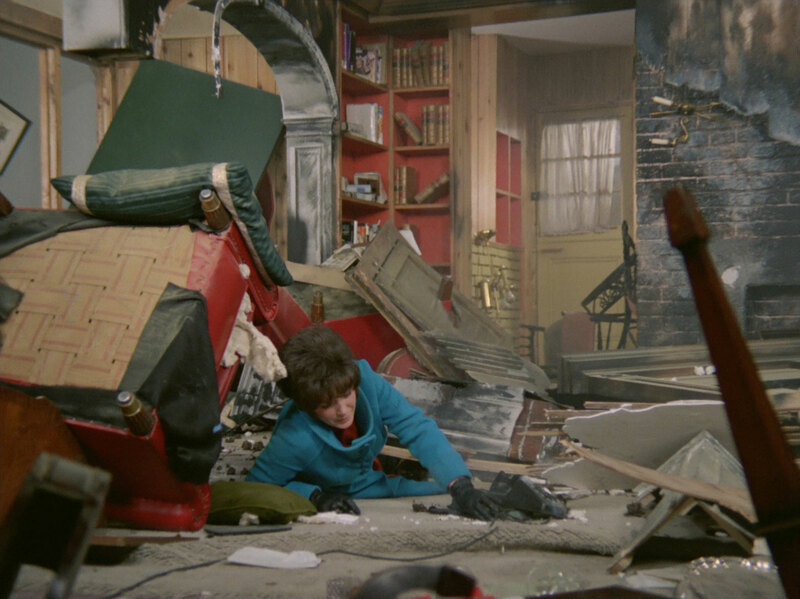 She leaves her room and along the passageway finds a recreation of Steed's flat, burnt out and half demolished - down the hall is the basement she escaped from. Retracing her steps, she encounters Wells and Jill. Wells is smug and tells her the situation they created would have made anyone talk, then Tara attacks them both and escapes. She fights off Murray and escapes in Steed's Rolls Royce. Steed meanwhile slumps forlornly as Miranda dances with joy, shouting "Checkmate, I think!" He suggests wrestling and is aghast when she says, "Anytime!" 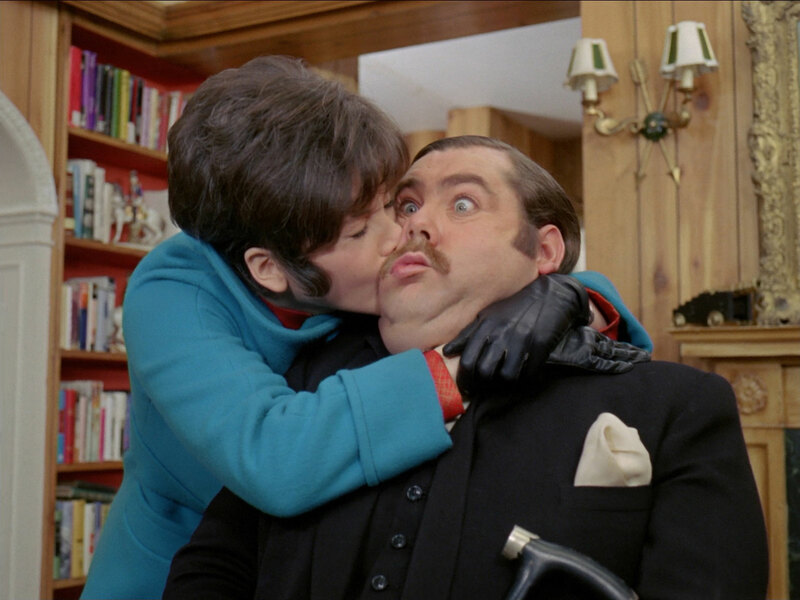 The villains are still searching Henley when Tara returns to Steed's apartment and kisses an astonished Mother with joy. She tells him all about it and he devises a plan to deck out another house as she had described to Firth. Special Services go to work and the trap is laid while Steed plays Ludo with Miranda - he's finally winning and she asks if he has a relative who's a Ludo champion. Steed confesses it's down to cousin Desmond - a demon dice-loader. Steed is demonstrating his dice to Miranda when Firth finally spots the weather vane and he and his cohorts enter the house. They hear a rattling sound from a room and burst in, guns drawn - only to find Mother holding a cocktail shaker. He tells them they've come to the wrong house then Rhonda attacks the three men behind and they're easily defeated. Tara hunts for the real house and finds it - the weather vane shaped like a clergyman - a canon. 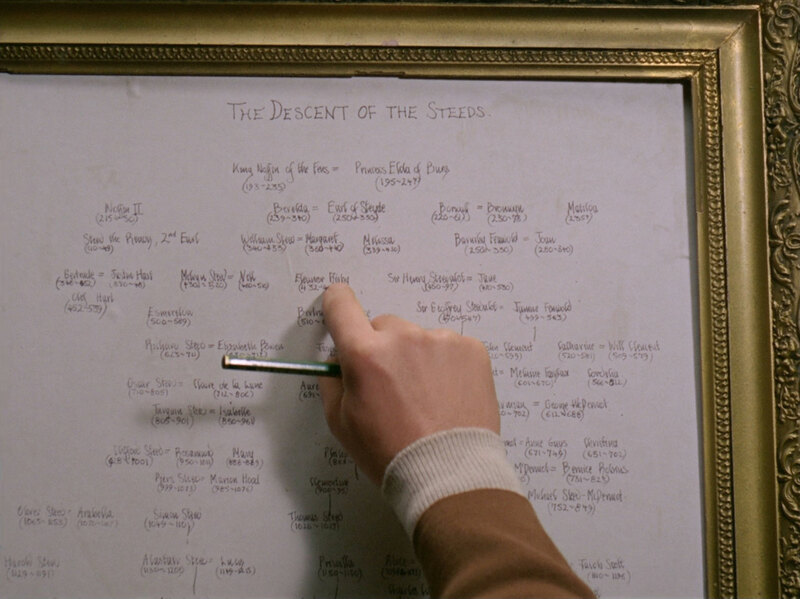 Tara drops by Steed's apartment and finds him tracing his family tree; he discovers he's descended - tenuously - from Royalty; King Noffin of the Fens!